The young sloth bear was panicked and terrified. 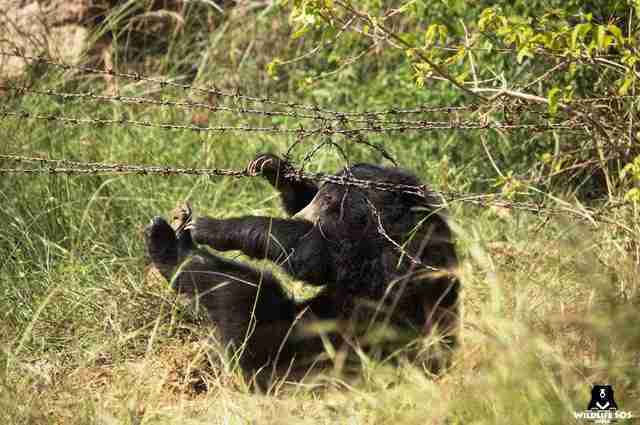 The barbed wire of a snare had tightened itself around his front leg — and no matter how hard he tried, the bear couldn’t untangle himself. Thankfully, local farmers spotted the sloth bear, who is estimated to only be about 10 months old — and they did the right thing. They alerted the local forestry department in Karnataka, India, and the forestry department got in touch with Wildlife SOS. A rescue team hurried to help the young bear. 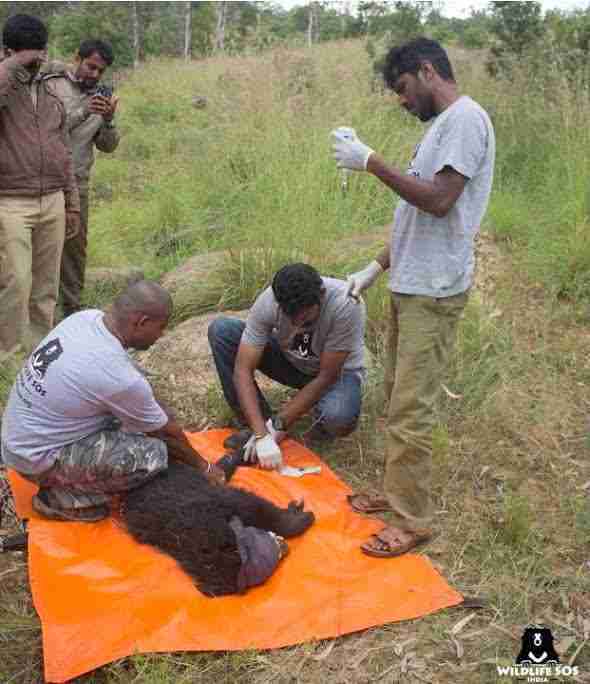 While he was pretty scratched up, the sloth bear hadn’t sustained any serious injuries, and the team managed to treat him at the scene without having to take him back to a rescue center for further rehabilitation. 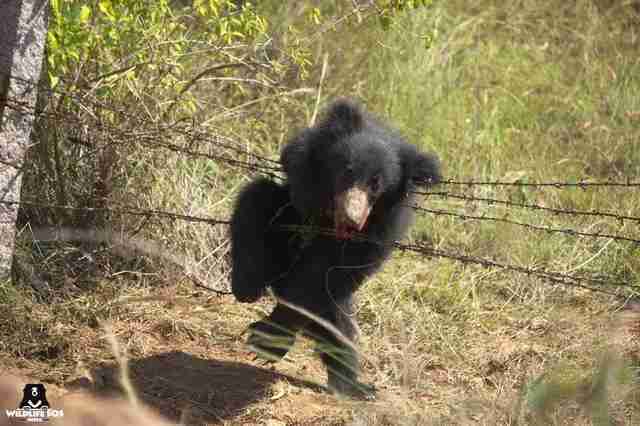 While it’s not known how the sloth bear got caught in the snare in the first place, it’s likely that he was just looking for food. Sloth bears typically eat insects, fruits and flowers in the forest. But these food sources are under threat as people cut down forests to harvest wood and excavate the ground for minerals. As a result, sloth bears will venture onto plantations where people grow berries and other fruits — and this can lead to trouble. Thankfully, rescuers managed to save the bear before he fell into the hands of a poacher. What’s more, the baby sloth bear was able to reunite with his mom. 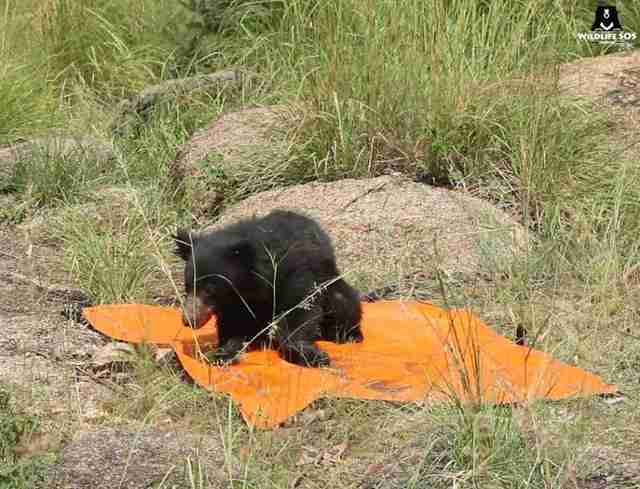 While this sloth bear was lucky to be rescued, others aren’t so lucky. To help sloth bears — as well as moon bears, elephants, leopards and other animals — you can make a donation to Wildlife SOS.